It is a DC Step Up Converter Regulator, DC 12V 24V Adjustable Voltage Regulator Notebook/Mobile Powe.. It is a Power Converter/Dual Output Power Supply Module, Input Voltage: 4.8~40VDC, Output Voltage: ±.. It is a Auto Boost Buck Converter ,Power Supply 150W 6-32V to 0.8-28V,Conversion efficiency Up to 9.. It is a Red LED LM2577 Boost Converter,Input voltage :DC 3-34V,Output voltage: DC 4-35V (adjustable)..
LM2577 DC Boost Voltage Regulator Charger, High efficiency, small size. 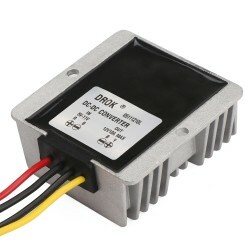 DC 3-34V to 4-60V voltage ou.. It is a Adjustable Step Up Voltage Regulator Boost charger, voltage range 3.5-30V To 4-30V Boost Con.. The LM2577 boost with led power converter module, high power, input voltage 3.5-30V, output 4.0-30v,.. It is a Adjustable Boost Converter,Voltage Range :DC 4.5-28V to 4.5-30V,It has reverse polarity prot.. The boost converter LM2587 voltage modules, input voltage 3.5V-30V, output 4.0V-30V, maximum input c..
Mini DC-DC Step-up converter 3V to 5V 1A Ultra Small Boost Circuit board Charger For MP3 MP4 PSP etc. It is a DC Step-up converter,Power Supply DC 3V to 5V 1A,Conversion efficiency up to 96%,It has Comp..
DC / DC Boost Buck Converter Voltage Module, Voltage Wider,Input Voltage 3.5-28V, Output 1.25-26V, M.. The is LTC1871 Green LED Adjustable Boost Converter,Input Voltage DC 3.5V-30V,Output Voltage DC 3.5V.. It is 100W Adjustable Voltage Regulator/Adapter/USB Charger, Input voltage : DC 3~35V ( limit 36V),.. It is a Power Converter/Power Supply Module/Adapter, Input voltage: DC 4.5~32V, Output voltage: DC 5.. It is a 48W Auto Buck Boost Converter/Power Supply Module/Car Converter/Adapter, Input Voltage: DC 1..